Posted on November 22, 2009	by Lou Murray, Ph.D.
Is there anything as cheerful as a daffodil in spring? As the weather turns cold and blustery, I’m on my knees looking forward to spring as I plant daffodils and narcissus in our backyard. Vic and I began our backyard makeover in earnest last January when we had a misshapen magnolia dug out. That was the last of the original trees in our backyard planted by the original homeowner over 30 years ago. All but the magnolia had become diseased and were long gone. While the magnolia had pretty blooms, it constantly dropped big leaves that were hard to compost, and it interfered with our plan of converting the backyard to food production. 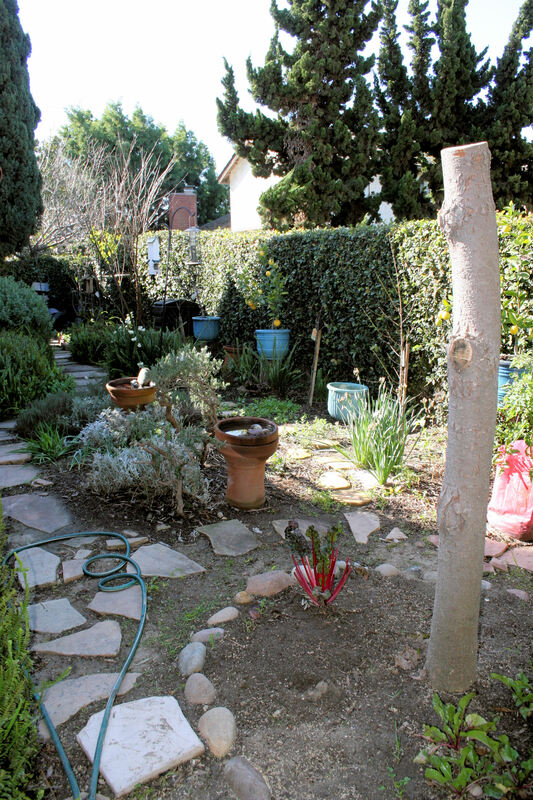 My citrus trees were too shaded to produce fruit and growing veggies in the shade of the magnolia was difficult as well. So out it went. All that was left of the backyard magnolia after our tree guy left was this stump, which our gardeners dug out. In place of the magnolia tree and an oblong herb garden, I installed three raised beds for veggies and reduced the size of the herb garden to a small circle. I’ve finished resetting the pavers and am now planting both single and double paperwhites from bulbs I salvaged, as well as some new Geranium Daffodils and Tahiti Daffodils. In reading about narcissus and daffodils, I learned that narcissus is an older word that is being supplanted by daffodil for the common name. But the Latin genus name remains Narcissus, so I figure we can call them by either name. I also learned that daffodil bulbs contain calcium oxalate, a poison that is found in the sap of daffodil leaves and that can cause skin rashes. What is it with plants and oxalates, anyway? Seems that everything I’ve written about lately has oxalic acid in it (rhubarb, sorrel, and even a tad in chard). Apparently some people have confused daffodil bulbs with onions and eaten them by mistake. Not a good idea. Narcissus/daffodil bulbs also contain lycorine, a poison. Don’t confuse lycorine (poison) with lycopene (a good compound found in tomatoes that may help prevent macular degeneration, a cause of blindness). Lycorine is a toxic alkaloid that is found in narcissus bulbs as well as the bush lily (Clivia miniata). It’s hard to believe that anything that pretty can be so hazardous. I’m planting the narcissus bulbs where I’m not likely to confuse them with food, and plan to just enjoy their beauty next spring. With roses, irises, Nemesia, nasturtiums, and allysum blooming under our fruit trees (peaches, nectarines, apricot, plum, apples, and citrus), I’m looking forward to a spectacular spring in our backyard. For more information on planting and care of narcissus and daffodils, see http://www.hort.purdue.edu/ext/HO-11.pdf/. This entry was posted in Uncategorized and tagged bulbs, calcium oxalate, daffodils, flowers, lycopene, lycorine, narcissus, paperwhites. Bookmark the permalink. I swore to myself that I would plant more bulbs this fall, but never did. Sigh. I do have daffodils, but the other bulbs don’t last in my garden. The rodents all dig them up and eat them. So I’m glad there is at least one spring bulb that works for me. I still want more though – especially crocus. I miss having their cheery little faces every spring. I have to visit my neighbor that has them. I don’t know why her squirrels don’t dig hers up too. Well maybe next year I’ll plant some under chicken wire – maybe. Hi Daphne, thanks for stopping by. Squirrels eat bulbs? Uh-oh. They’re not native to California, but fox squirrels have moved from LA to Costa Mesa to Huntington Beach, where I live. Last year I had occasional visits from squirrels, but this fall I’ve had two in the yard every day. That may be a problem that I have to deal with in the future. BTW, paperwhites and crocuses do well in pots and you can force them into bloom whenever you want, then plant them in the garden when the ground thaws. We do like to see the daffodils in spring. But we are starting to look for dual use bulbs — that look nice but could be eaten. I just read about a class of 5-year-olds that were poisoned by a daffodil bulb in their soup (they were adding onions from their class garden and got a daffodil in the mix). So, yes, it’s best not to put toxic plants next to your food where they might be confused. I the wild, the rule I learned is if it looks like an onion and smells like one then it’s an allium and edible. If it doesn’t smell like an onion, it may not be edible. Hi Chris, thanks for stopping by. I read about that same kindergarten class. Too bad an adult didn’t recognize the difference between an onion and a daffodil bulb, but as people get more and more removed from the land and sources of food, such confusion is more likely. Love your blog. Hey I promise not to get the two mixed up. But I’m going blind anyway. They deer don’t eat the daffodils thank the dear Lord. I guess that is why you never see any blind deer. So Lou, I love your blog and love being on your blogroll and I looked all over the place..for the award….but can’t find it. I’ll be back tomorrow to take another looksie. I’ve got to go deliver the boxes for Operation Christmas Child. Gonna be gone all day. Just wanted you to know I came looking cause wouldn’t miss something you gave me for anything in the world. I love your bit about Monterey. Hi Anna, I haven’t finished my post on the Honest Scrap Award, so it isn’t up yet. Meanwhile, CONGRATULATIONS on passing the 200,000 hit mark on your blog. Way to go! Start with a free option. There is plenty of time to pay them later if you find you really like it and want some of the add-ons, like your own domain name.